A display of 22 pairs of combat boots – representing the number of veterans who commit suicide every day – sat in front of Frog Fountain. 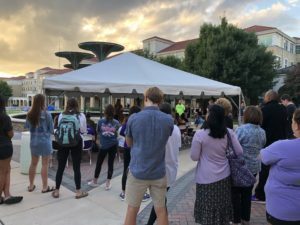 Silence filled the TCU Commons Wednesday night while around 60 people held lit candles to remember the lives lost to suicide. Since 2010, seven TCU students have died by suicide, said Eric Wood, associate director of Counseling and Mental Health. During the candlelight vigil, Rev. Todd Boling tearfully read a message from a student and veteran who was directly affected by suicide when his friend and fellow veteran took his own life. Brenna Wolfskill, a first-year nutrition major, went to the vigil to pay respects for fallen veterans and family members. The vigil was the last event during National Suicide Prevention week and offered students a time to mourn their losses. “Tonight is a time to reflect and remember,” said Brad Stewart, associate director of TCU’s Wellness Center. “It’s important to see groups of individuals here for the same cause knowing that you’re not alone. With National Suicide Prevention week coming to a close, Stewart wants to remind students of the resources on campus. “The Need to Talk is on the back of every student ID, that is linked to TCU resources,” Stewart said. If you or someone you know are dealing with thoughts of suicide or in need of mental health counseling, contact the 24/7 counseling hotline at 817-257-7233 or go to the counseling and mental health center website. Megan Guter is a senior journalism major and FTDM minor from New Orleans, Louisiana. Megan is an aspiring fashion icon and pop culture enthusiast. She loves reality television, boybands, and New Orleans to an extreme level. She is also a co-host at TCU's one and only celebrity entertainment podcast, Celebrity Dish. Geaux Frogs!